Occasionally, the common name of a plant is a bit misleading. The name �Autumn Sage� conjures the image of a fall-flowering herb, yet Bailey Hortorium�s Hortus Third describes this plant as a fall-flowering sub-shrub. Earth Kind uses research-proven techniques to provide maximum gardening and landscape performance while preserving and protecting the environment. For more information on Earth Kind Landscape Management Practices see our web site: https://earthkind.tamu.edu My experience with the Autumn Sage over a twenty-year period has been that it is almost constantly in flower from late spring until hard frost. Robert A. Vine�s book, Trees, Shrubs, and Woody Vines of the Southwest, contains a more accurate description of the flowering habit, indicating summer and fall flowering on the shrub up to 3 feet. The species name �Greggii� honors Josiah Gregg (1806-1850), an early American explorer and botanist. S. Greggii is native to dry, sunny sites in southern and western Texas and New Mexico. It may also be found in the Mexican states of Coahuila, Sonora, and Durango. Although generally ignored by most nurserymen and home gardeners in this century, S. Greggii was a frequently-found plant in the cottage gardens of early Texas. Once established, the plant usually thrives on existing rainfall. It does need at least tolerably good drainage, and thrives in full-sun or partially-shaded exposures. Thanks to increasing awareness about the plant among Extension horticulturists in Austin, San Antonio, and other areas, S. Greggii is now beginning to be utilized. In recent years, the discovery of a broad range of colors within the species has greatly increased their landscape value. Pure white, rich red, pink, and salmon have now joined the more common purplish-red selections. Flowers appear in terminal racemes, are tube-shaped and two-lipped, and about one inch long. Leaves are opposite, narrowly oblong, with blade length 1/2 to 1-1/4 inches long. The foliage has a pleasant, spicy scent. Propagation is usually from cuttings taken during the growing season. Landscape uses of Salvia Greggii are many. 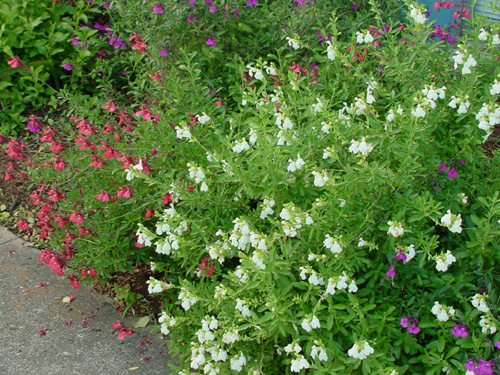 It is a natural for use in containers, masses, or borders, for low-maintenance landscape color. In landscape developments where a refined look is desired, the plants respond very well to periodic shearing to remove old flower stems during the summer. Occasional light applications of a balanced fertilizer, and irrigation during unusually dry periods, will ensure repeat flowering from May through November in most of Texas. Little is known about the winter hardiness of Salvia Greggii north of the Dallas/Fort Worth area, but West and South Texas are excellent locations. Well-drained sites in East Texas produce handsome specimens. Salvia Greggii is a beautiful, practical source of landscape color in most of Texas. It is another example of �rediscovering� plants that were popular in the early gardens of Texas, but ignored by most people in the recent past. It will be available from Texas wholesale nurseries specializing in native plants, as well as garden centers in much of the state.